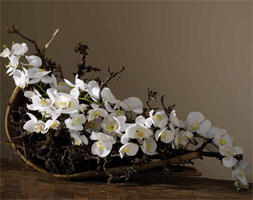 Silk Flowers & Decoration from Ora Home Ora Home Ltd.
Our range of silk flowers, flowering branches and individual branches are crafted from only the highest-quality silk. 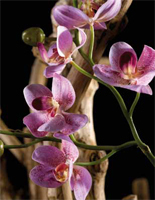 Unbelievably realistic and durable colours combine with exquisite detail in the stems, petals and buds. 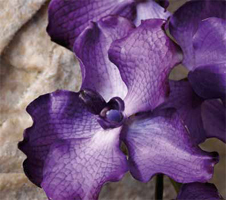 Silk flowers of this quality are virtually impossible to tell apart from the real thing. They are therefore a perfect solution for creating elegant interior settings with a fresh, welcoming character. Cut flowers and individual branches are supplied in handy boxes, allowing you to arrange them yourself. The sizes vary from flower heads to stems of over a meter in length. Wood is a wonderful and powerful decorative material. Our collection includes a wide range of products for both arrangements and interior decoration. These natural products embody perfection and capriciousness, ensuring that they add character to whatever setting they are placed in. No two are alike, which guarantees you a unique object. The wood has been tanned and lined by the hot sun, and sandblasted by the wind. They are fantastic decorative items, available in white, black and natural colours, with or without bark. The teak stumps originate from Asia, where they are a waste product of carefully managed teak plantations. A number maintain their authentic capricious shape to heighten their elegance as a horizontal or vertical decorative feature for indoors or outdoors. The sturdiest stumps are crafted into beautiful teak objects, ranging from plates and bowls to sofas and chairs, each of which is also completely unique. Teak can also be treated with wax to give it a richer, darker colour. We provide a solution for all of those empty corners at your home, office, care institution, conference centre, restaurant etc. that are too dark or draughty for real plants. Our collection of blossoming and lush green silk plants allow you to enjoy all of the benefits of this high-quality product as soon as you put them on display. All of our silk plants are water and damp proof, making them perfect for brightening up your hall or patio. They are frequently used in combination with living plants. The individual silk plants range in size to ceiling height, although larger sizes can be made to order for atriums and other specially sized areas. 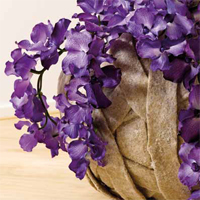 We have over 100 products in our Flowers & Decoration range.